Featured image: 1832 “Philander” Ipswich Village Map. Information below is adapted from Thomas Franklin Waters, Ipswich in the Massachusetts Bay Colony Volume 1, and Volume II. 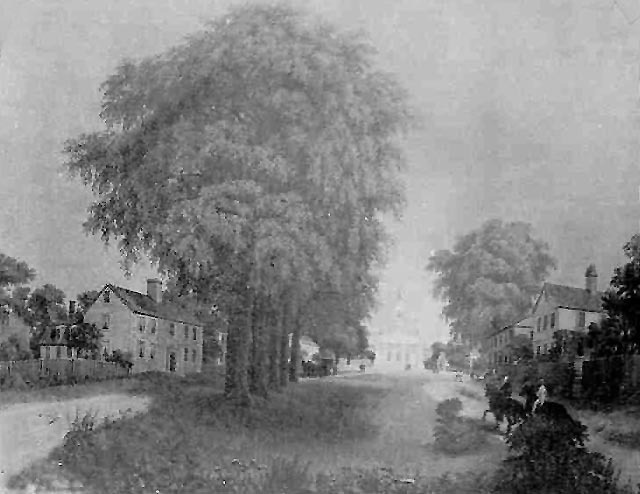 Ipswich was settled in 1633 in an area the Native Americans called “Agawam.” The settlers immediately renamed it “Ipswich.” During the 19th Century, there was a movement throughout the United States to change the ancient names of American streets to something more dignified and uniform. Thus our country is full of streets bearing names such as Maple, Green, Summer, Main, etc. Many Ipswich Streets lost their original names, but a few fortunate ones, such as Turkey Shore and Labor in Vain, gained them back. The principal thoroughfare was quaint, venerable High Street. The main portion was variously called ye Great Street, ye Long Street, High Street, Hill Street, and was sometimes alluded to as the King’s Highway, which was the Bay Road. The upper end gained the nickname “Pudding Street “ from an ancient story. Depot Square was Bridge Street but there’s no record of a bridge. It continued straight on today’s Washington Street before the era of the locomotive. Not to be confused with Bridge Lane, which was Green Street, it was the way to the mill bridge from the western side of the village. It began at present day Market Street, and became Scott’s Lane, and later Gravel Street from the two gravel pits at the base of Mount Pleasant which furnished the road material. It rounded onto present-day Liberty Street, the name Gravel Street being retained until it reached High Street. Linebrook Road was called Boxford Road and upper High St. was called Rowley Road. Lords Square was named after Asa Lord who operated a store there, not to mention that almost every house on High Street was occupied by someone from the Lord family. Before the 19th Century it was called Brewer’s Corner . 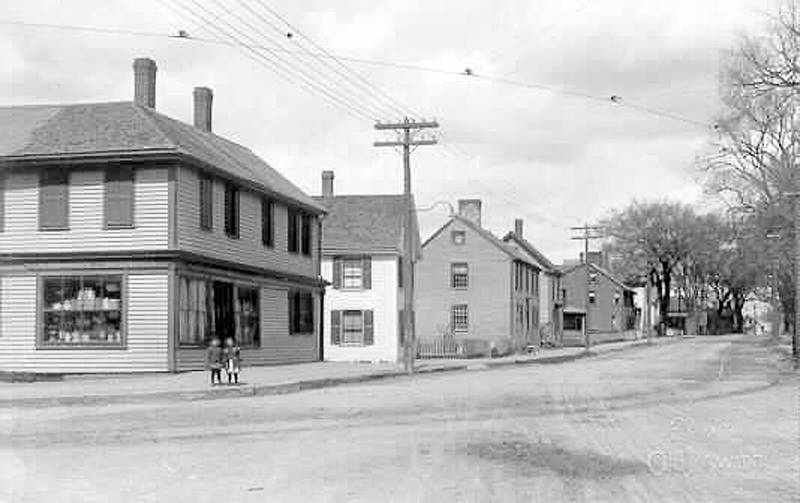 Spring Street was Hog Lane, and before the Bay Road was built it was known as “the Way to the Merrimack.” It came to be called Brook Street, not too different from the present name Spring Street. For the Indians and the earliest settlers, this was the main road for eastern travel, and continued to be used for many years. Its course went over Town Hill and by bridge across Egypt River to its juncture with High St /Rt. 1A. The oldest section of County Street is between East Street and Green Street, and was called Cross Street. The County Street bridge was built in the mid-19th Century. From the River to the South Green, the other side of County Street was Mill Street. On the north side of the river a public way was preserved from any encroachment. Part of it is Water Street, and it continued on what is now the Sidney Shurcliff Riverwalk to County Street. Looking across to Summer St. from the little park on Turkey Shore. Photo by Edward L. Darling. On the south side of the river, Turkey Shore connects to Labor In Vain Road and Poplar Street. The maps of the 1800’s give it the name Prospect Street, but I am told that Ipswich residents demanded that it be given its old name back, and thus we still have Turkey Shore. Labor in Vain also retained its ancient name, so-called for the “Labor in Vain fields” which often flooded. Gould’s Creek was named for a resident on the road, but was originally called Labor In Vain Creek. If you ever tried to paddle against the tide at Gould’s Bridge you’ll understand. There was no single Town Wharf back in the day. 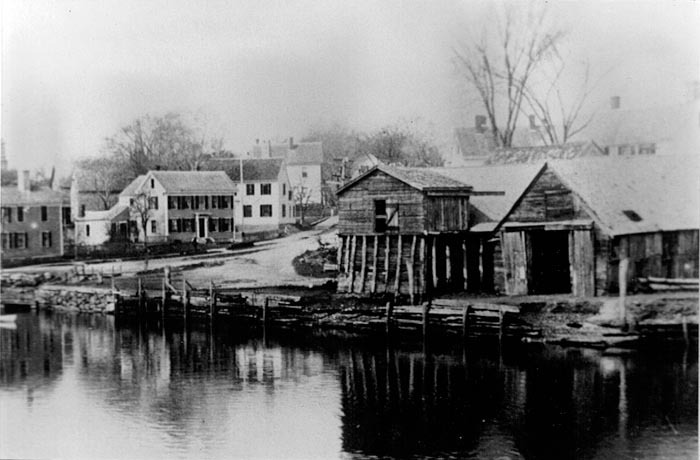 Over the years, from Great Cove continuing along Water Street and East Street to the end of Agawam Street, there existed Hovey’s Wharf, Heard’s Wharf, Brown’s Wharf, Glover’s Wharf, Rust’s Wharf, Hunt’s Wharf, Dodge’s Wharf, and Wainwright’s Wharf. North Main Street was “the Way to the Mill” if you were going downhill, or “the Way to the Meeting House” when going uphill. The road in front of the Ipswich Library was Common Lane (because it faced the Town Common, later known as Meeting House Green and now as the North Green.) Common Lane continued to Green Lane, which became Green Street. Chebacco Way was a path from Turkey Shore Road to the Labour-in-vain fields and the Heartbreak Hill lands and included Rocky Hill Road and part of “Old England Road,” and continued to Chebacco, which is the part of Ipswich that became Essex. The road came to be known in the early days as Argilla Road, named for the clay that dominates the soil. Argilla Road led to Patch’s Beach in the 19th Century, later Brown’s Beach, Lakeman’s Beach, and today known as Crane or Crane’s Beach, but we still can’t decide which. Today’s Argilla Road continues toward town on what was originally School Street to the South Green, which was for centuries known as the Schoolhouse Green. 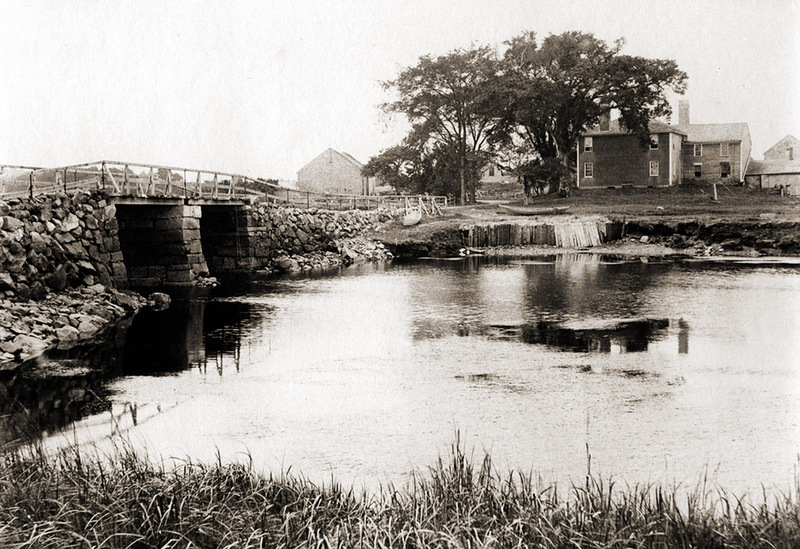 South Main Street began its existence in 1646, when the first wooden cart bridge was built at or near the Choate Bridge. Maps from the 1800’s show South Main Street continuing on today’s County Road, which was an ancient way by which foot-travellers from the south and east forded the river near the present pedestrian footbridge. From Boston to Portland it became the Bay Road and after crossing the River it wound up the hill to North Main St. and High Street. Mill Street: Access to the mill was gained through the present Union Street. Saltonstall Street is named after the town’s first miller, but was named Winter Street in the Village Maps from the 1800’s. It was the original location of the Whipple House, which was moved to the South Green. A crooked foot-way led from Depot Square, through the Hammatt St. parking lot across Farley brook (now buried underground), then on Wilde’s Court, crossing today’s Central Street and continuing up the hill turned sharply to the right, entered North Main Street. This way to the meeting house for settlers in the northwest section of the town was known as Pindar’s Lane. The upper end of it still exists as Loney’s Lane, but it ends on Warren Street, named after the engine and firehouse which were once located there. Brown Square is so-called because of Mr. Brown and his coal gas plant. The brick building across from Ithaki Restaurant is all that remains, but you can see the circular foundations of the coal gas tanks next to it. Dirty Lane, because it crossed muddy Farley Brook, was afterwards called Baker’s Lane, and now bears the name Mineral Street. 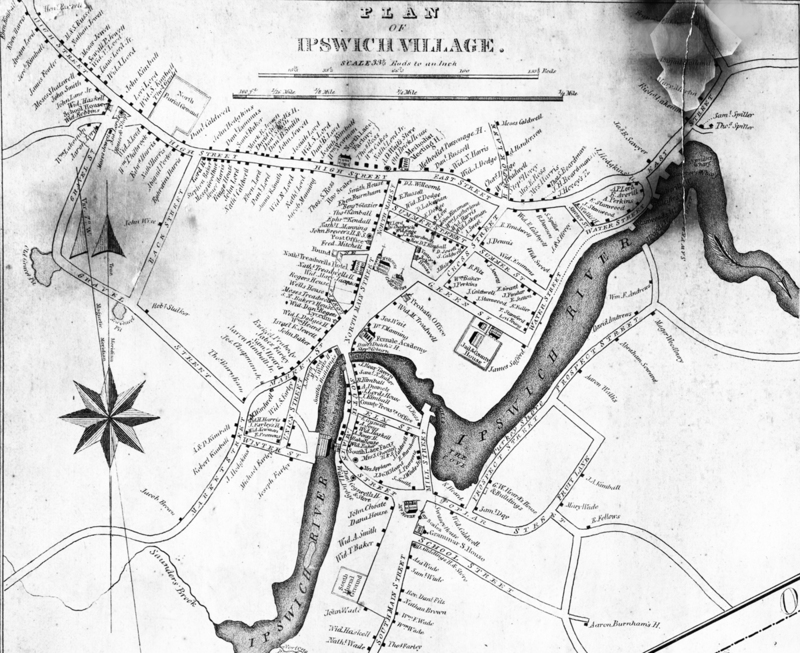 The 1832 Ipswich Village Map labels it Back Street. 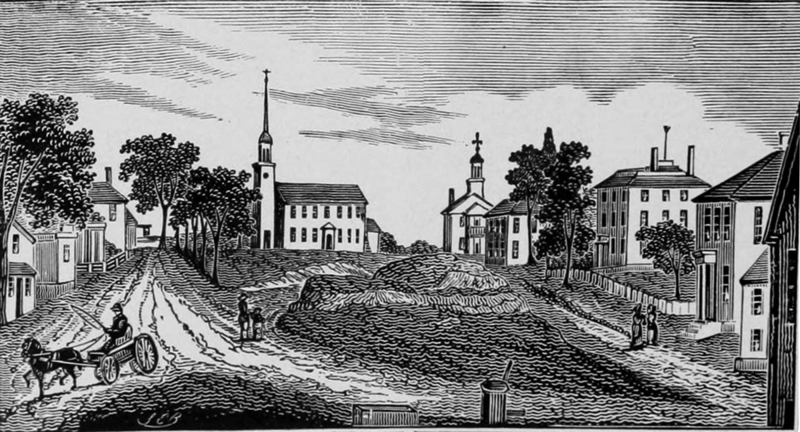 Central Street was once a wetland and did not exist until the mid-19th Century. Manning Street and Hammatt Street were created shortly thereafter. This is why the houses on those streets are almost all Victorian. 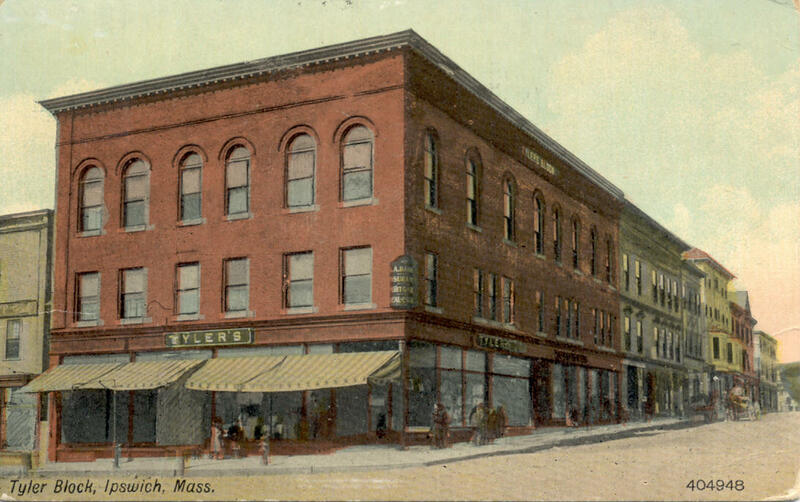 Five Corners was Quint’s Corner to many people growing up in Ipswich, but in the early 20th Century it was called Tyler’s Corner.In the 19th Century, Market Street replaced North Main Street as the commercial center of town, and the intersection became known as Market Square. Candlewood Road was named for the pine trees that provided a pitch that could be burned like a candle. 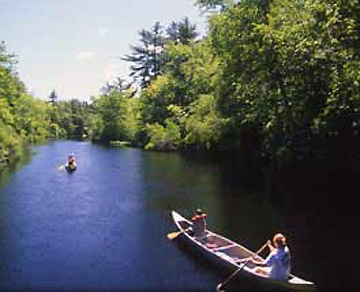 The Candlewood area was settled by the Kinsman, Lakeman and Fellows families, who all have roads named after them. The land bounded by the Bay Road, Essex Road, Candlewood Road, Fellows Road and Lakeman’s Lane was a part of the Common land of the Town. When the Common lands were divided into Eighths in 1709, it became part of the division known as the South Eighth and was known as The Inner Common of the South Eighth. Mill Road replaced an older road that led to Warner’s Bridge, where several mills operated in the 19th Century. Pineswamp Road leads to Willowdale Forest, which is all pines and swamp. It was part of the common land. The Appleton Family named Waldingfield Road after the place of the family’s origin in England. Heartbreak Road was named after the hill, which was too hard to farm, but a poem attributes the name to an Indian princess who waited for the return of her English lover. Old maps label it Hard Brick Hill for the clay that dominates the soil. Jeffreys Neck Road is named after the Englishman who had already occupied the Neck when the Puritan settlers arrived. They paid him to leave. Leslie Road honors one of the early pastors of Linebrook Church. There was a farm but no other houses on Mount Pleasant until the town’s first subdivision was laid out on Mount Pleasant Avenue and Agawam Street, which is now Vermette Court. 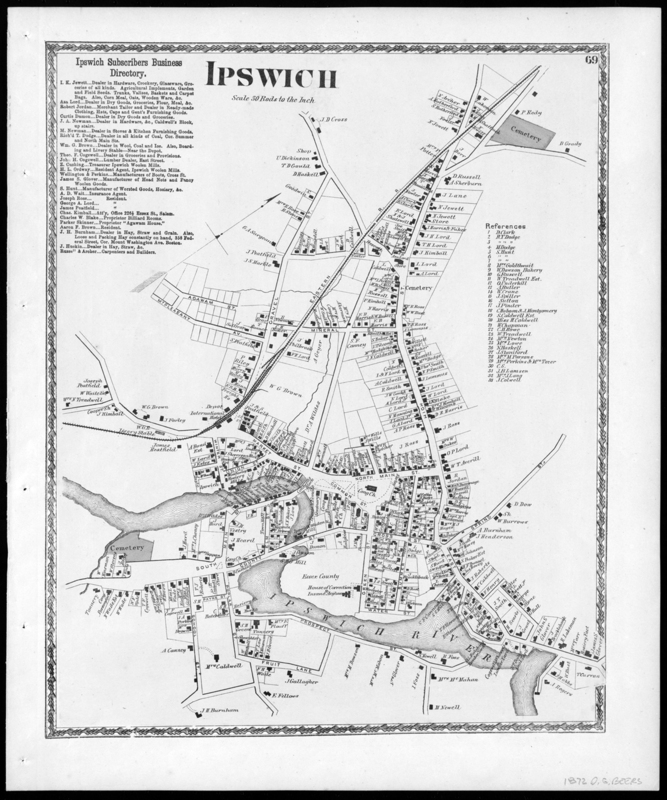 The 1872 Ipswich Village map shows the lots laid out but with no houses yet built. 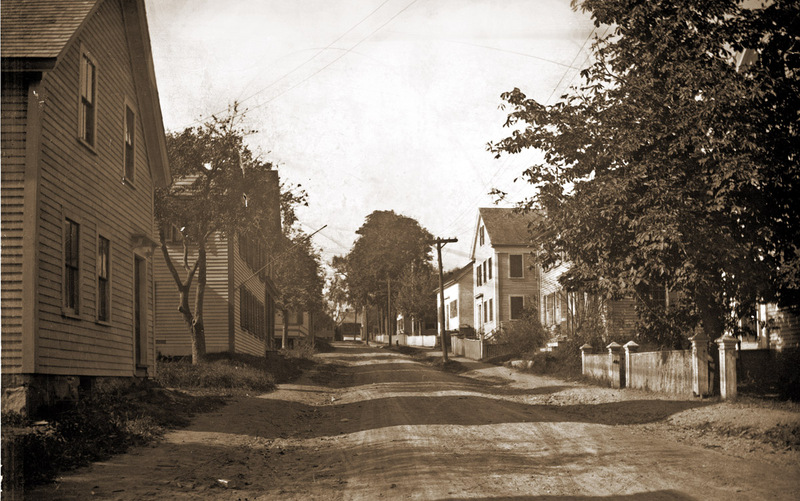 In the first decade of the town’s existence, Topsfield was a part of Ipswich known as New Meadows. The part of Ipswich known as the Hamlet was “set off” as a separate parish in 1714-15 after several appeals to the Town and to the General Court. It named itself Hamilton. Chebacco followed suit in 1818 and renamed itself Essex. 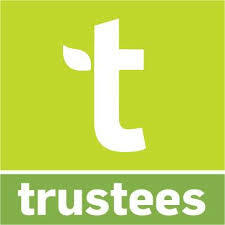 Why , when you walk down one street in Salem Ma, , will the name change three times ? Very confusing ! Road names made sense when the roads were new, but the town grew around them. In Ipswich, Rt. 1A from the north is High Street, and continues straight as High Street at Lord Square even though 1A curves to Central St. That’s because Central Street was a wetland until about 1860. High Street continues to North Street, where it abruptly changes its name to East Street. That’s because it was once the center of town. East Street continues one block where it stops at County Street, but County Street becomes East Street and it continues past the wharf to Jeffreys Neck Road. This is because County Street was once only two blocks long, named Cross St.
Or, go to Market Square (Five Corners) in Ipswich, the intersection of Market, Central, North Main and South Main Streets, even though there’s really just two streets crossing. But that’s another story.